When my hubby and I first married, we traveled a lot. In fact, the first year of our married lives we spent in Ecuador. We taught English eight weeks on, two weeks off, so during our two week breaks, we made it our goal to travel every inch of the country. But, as time moved on, the opportunity to travel became less and less. There’s these things called jobs, and kids, and money. We prioritized other parts of our lives, and before we knew it, we had not traveled together in years. Yes, years. So, last Spring, we decided it was time to travel again. We were looking for the perfect getaway since our family expanded to four last year. The baby was getting close to a year, but something still nagged at me to go too far away. That’s a lie. I wanted to go to Mexico, but my husband didn’t want to go too far. (wink, wink). Nonetheless, I was thrilled to go anywhere, really, as long as there were no children there. Well, there could be children there, but they couldn’t be mine. We lined up both sets of grandparents to come babysit, and proceeded to make our plans. We had heard great things about a little town in the mountains. And luck would have it, Highlands, North Carolina sits only a couple of hours from home. We stopped at Whitewater Falls halfway between Greenville and Highlands. Falling over 800 feet, Whitewater is the highest falls East of the Rockies. Nestled in the southern Appalachian Mountains, surrounded by the Nantahala National Forest, Highlands is home to less than 1000 permanent residents. What it lacks in size, it more than makes up for in spirit. Situated at just above 4000 feet, the cooler summer weather awaits. The lovely main street boasts boutiques, world class restaurants, several quaint churches, antique shops, and of course, the renowned Old Edwards Inn and Spa. I can't help it. I love old, beautiful doors. Although we didn’t stay at Old Edwards, it’s hard to ignore the hotel’s influence over the town. Not that I’m complaining. The hotel is gorgeous, with an old world, European feel. The staff are delightful, and there is plenty to partake in even if you choose to stay elsewhere. Plus, with two sister properties in town, 200 Main and Half-Mile Farm, you may find that a different property is more your style. We opted for the 200 Main, located just off Main street on the opposite end of town from Old Edwards. It definitely did not disappoint and is a great lower cost alternative to Old Edwards. We stayed in the King room with a fireplace, and it had a balcony, seating area, and completely renovated bathroom with heated floors and fancy shower. I am now obsessed with heated floors. The inviting pool felt just right in the warmth of the afternoon. When we arrived, we went straight to lunch at Wild Thyme Gourmet. We snagged the last table on the outdoor patio, and ordered Asian-inspired chicken salad and ice cold beers. I let out one long exhale. This was the first lunch we’d had in a while with no high chairs, kids menus, or high-pitched squeals coming from our table. After lunch, we took a nap as an afternoon thunderstorm rolled in. The weather cleared just in time for our dinner reservation at Madison’s, the main restaurant at Old Edwards. It was such a short walk from 200 Main that we arrived early and enjoyed a cocktail at the Hummingbird Lounge first. The dark wood paneling makes the room feel like a personal library. Well, a personal library with a bar. And the bellini I ordered had a unique twist with a frozen peach. But, by now were were hungry. Dinner at Madison’s was truly memorable. From the first bite of pimento cheese, to the perfectly executed entrees (I had fish, Matt had duck), the meal was both nourishing and relaxing. Despite our best intentions of sleeping in the next morning, we awoke early, ready to start our day. We fueled up with breakfast at Mountain Fresh Grocery, before heading out to hike. Having not been hiking in a while, the 1.4 mile (one-way) Glen Falls, just 3 miles from town, off of a dirt road, down 106S. It’s easy to find, and early on a Friday morning, only one other car was parked at the trailhead. The series of three falls cascading some 60 ft are impressive, and the blue sky peeking through the dense forest shone brightly. It’s worth venturing to all three falls, although, even if you only walk the 15 minutes to the first falls, this is still a worthwhile way to spend your morning. Do remember it’s easier downhill on the way in, so reserve some energy for the climb out. As we were leaving, a large group with a guide was headed in toward the falls, so go early to avoid the crowds. After a lovely morning outside, we were hungry and headed back to Old Edwards for lunch at the Wine Garden. It was such a beautiful day, we couldn’t imagine being inside. Both the setting and the food at the Wine Garden (open seasonally) filled our souls. We spent the afternoon moseying around town and enjoyed a casual dinner at Ugly Dog Public House. With our hiking legs under us, we attempted a more difficult hike on day two. Now that we had seen a few waterfalls, we thought we would hike a mountain. The 2.5 trek up Whiteside Mountain was serene and gorgeous. 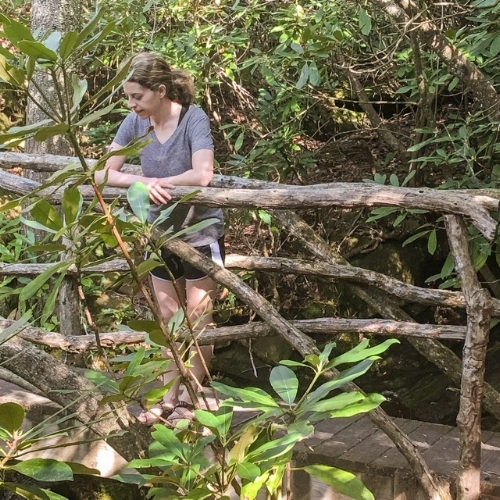 Small streams of water trickled under foot, and large groves of Mountain Laurel graced the side of the trail, forming tunnels to block the sun. Wildflower season had just begun in mid-May, and several small groups of local hikers shared their extensive knowledge of the beautiful wildflowers growing all around. When we reached the summit, the views opened up, and we stayed for a while, quiet and content. We saved our best hike for last. The evening of our last night in Highlands, we forewent the expensive, fancy dinner, and decided to picnic at Sunset Rock. We stopped at Mountain Grocery to purchase our provisions, and walked past the library on the East side of town. Follow the groups of friends and couples headed that way, and make sure to get there before sunset to relax and enjoy the scenery. It was a splendid ending to a lovely getaway. With the Old Edwards Spa, tons of hiking and nature to explore, and the general laid back vibe of the town, Highlands is the ideal wellness retreat. Check out this Ayurvedic Retreat Package taking place this fall at Half Mile Farm! All in all, the trip was a rousing success. We didn’t go very far, or for very long, but we went. And it was perfect.